Freedom States Alliance needs to be told what a lot of Republicans need to often be reminded — NRA is a single issue organization. Instead of looking at militias, such as the Hutaree, as some kind of an outlier, maybe it’s takes to confront the gun lobby about it’s rhetoric that they do in fact support and enable domestic terrorism. It’s only when a militia is raided by the FBI that suddenly the NRA goes very, very quiet. Suddenly, their extreme ideology and rhetoric doesn’t look so appealing. Did it occur to FSA that maybe NRA is silent about it because it’s not even remotely related to their issue? Did it even possibly enter into the minds of FSA that maybe some of us value the right to keep and bear arms to defend against domestic terrorists, and think folks like the Hutaree are just as nuts and dangerous as they do? 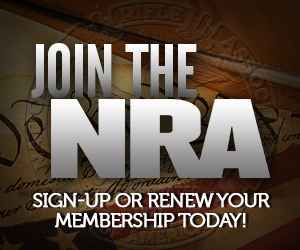 NRA is a single issue group — preserving the Second Amendment protecting an promoting the Shooting Sports is their core mission. Their issue is not, last I checked, making war on the State of Michigan or the United States in order to bring about a final apocalyptic battle with the Antichrist. At least I didn’t notice any literature about that last time I was at headquarters. Ack-Mac would charge a lot of something like that anyway. Maybe ridiculous rhetoric like this is why FSA was folded into an umbrella group. Generally speaking, smearing four million Americans with this kind of crap isn’t a good way to make friends. If I had to guess which country was most likely to take the path of systematic genocide as a terrorism fix, Russia would be my candidate. They’ve killed their own people in boxcar lots within living memory and, unlike Germany, haven’t had to deal with fifty years of international tongue-clucking and scolding because of it. (Not that caring what others think has ever been a defining characteristic of Russian leadership anyway.) The Chechen separatist strategy doesn’t strike me as very bright, poking this particular bear with this particular stick. If there’s any lesson in post-Soviet Russia, it’s that Moscow doesn’t need much of an excuse to start shooting Chechens. Peter Leboon was concerned because his brother, who he said began showing signs of mental instability three years ago, had a permit to carry a concealed weapon. Given that Philadelphia will revoke an LTC if you spit on the sidewalk, I find this difficult to believe. The report says the guy had multiple run-ins with law enforcement. Even in fair jurisdictions, the Sheriffs are liable to revoke in that instance. I’m going to suggest what the family found was the copy of the Application/Record of Sale, which looks very official, and kind of like a permit, and the Inquirer took this to mean he had an LTC. I might be wrong, Maybe he did have an LTC, but this is the problem with Josh’s “Google Research.” He’s relying on reporting by a media who know nothing about this issue, and who very well might have gotten this completely wrong based on a misunderstanding. I sure wish I could get paid what Josh does to compile research by searching on the Internet. It’s for the children, you see. Man. Add some caps lock action to that and it could have been written by Abby Spangler. Think of the CHILDREN, and the SCONES. WHY WON’T ANYONE THINK OF THE SCONES!?!?!?!? Brady Admits To Being Anti-Gun? They are noting the anniversary of the Reagan Assassination attempt, where Jim Brady was shot and disabled by a bullet to the head, but the headline reads, “Jim and Sarah Brady: We’re Safer Thanks to Their Anti-Gun Efforts.” So is Brady admitting this isn’t about reasonable gun laws, but about being “anti-gun?” I thought they hated that term. Now to be fair, I’ve had Opposing Views manipulate a few of my headlines, and maybe that’s the case here, but it seems like a fair manipulation to me if that was the case. UPDATE: Their blog post on the subject is called “Making Lemonade,” so it woud seem this is an OV manipulation on the headline. Like I said, I’ve had them alter a few of mine too. Mine they did for the sake of clarity, but it would seem to me the OV editors ought to avoid making wholesale changes to the language, especially if they don’t know the issue well. There’s probably some things I should clear up on the FOPA case in the Third Circuit. This was not a criminal prosecution. This was a civil rights lawsuit filed under 42 USC Section 1983, part of the Civil Rights Act of 1871. That changes things considerably from a criminal prosecution. The criminal charges against Mr. Revell were dropped. In order to sue a police officer in his personal capacity, you have to overcome qualified immunity. To do that you have to show the officer acted under color of law in violation of clearly established precedent. That’s a tough nut to crack. The plaintiff here, Mr. Revell, argued that FOPA’s peaceable journey language in 926A created an enforceable personal right. The Circuit Court upheld the District Court’s ruling that it could not, and that the plaintiff had to proceed with the suit on Fourth Amendment grounds. That means arguing the officer did not have probable cause to make the arrest. Since the Circuit Court found the arresting officer’s interpretation of the statute correct, they ruled that he had probable cause to make the arrest and retained his immunity against suit. I should note that based on the courts interpretation of the FOPA safe harbor provision, it would even be unlawful if, traveling by car, you stopped in a hostile jurisdiction for an overnight stay. Ironically, if you left the gun in the trunk of the vehicle, where it could be stolen, you’d actually have a better case that you were still protected by FOPA than if you took the locked case into the hotel room for safe keeping. This is an absurd result, but the safe harbor provision is unfortunately narrow in its wording. This would be one of the provisions that the National Reciprocity Act would fix. Looks like a security guard at a Roanoke J.C. Penney’s got a little overenthusiastic trying to apprehend a shoplifter by firing his gun into the air. I’m going to go out on a limb here and suggest that neither J.C. Penney’s or the mall it’s located in hire armed security, so the guy probably packed the firearm on his own. Now I can’t say a blame a guy for not wanting to take a bullet for a minimum wage security guard job at a mall. Given the job, I wouldn’t say packing a concealed pistol is unwise if he’s legally able to do so. But you’d think if you were defying corporate policy you’d exercise a little more judgement about when it is and when it isn’t appropriate to bring the gun into play. Virginia has a statute for misuse of a firearm. I wouldn’t be surprised to see this applied to this guy. It should be applied to this guy. Last night Bitter and I attended the Philadelphia Friends of the NRA Dinner. Normally I have pretty good luck at these things, but went home empty handed last night. That’s a real shame too, because I absolutely wanted to win the auction for the NRA Deputy Cat — an approximately two foot tall cat sculpture made out of scrap metal. Unfortunately, the bidding got a little too rich for me on that item. 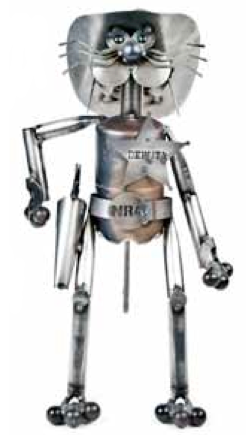 While I think hardly anyone could disagree that the world needs more NRA Deputy Cat, a good reason to go to Friends dinners, other than to help out NRA’s shooting programs both nationally and in your state, is the fact that you stand a pretty reasonable chance of walking away with a gun. I’ve generally had good luck at Friends events, and have won both a gun and a locking cabinet. I also picked up a pretty nice wooden NRA branded tool chest at silent auction. It was very good to see that NRA can still fill a pretty large venue even in Philadelphia. The Philly folks were playing the raffles more than participating in the auction, but everything raises money at the Dinner since all items are donated. I spent about 200 dollars on the raffles, hoping to have a good chance as either a Ruger LCP, a Weatherby Shotgun, a Glock 22, a Kimber 1911, or a Weatherby 12 gauge. But it wasn’t my lucky night. I didn’t win any guns, or the 50/50 drawing. The guy who won that took the 800 dollars and spent part of the money to buy a Remington 700 in .300 Win Mag at auction, which effectively donates the money back to NRA. Since all the guns they don’t raffle get auctioned, you can actually get some pretty good deals if everyone in the room already blew their money on the raffles, which seems to have been the case tonight. Some of the more expensive stuff was going for a bargain. Not NRA Deputy Cat though. Damn! I had just the place for it too. Does NRA have any Friends left in Philly? The complaint reveals that Revell’s luggage containing the firearm was, in fact, available to him while he was at the hotel. He alleged that, “[a]fter retrieving his bag, because there were no more connections to Allentown until 9:45 a.m. the following morning … , [he] went directly to, and stayed the night at, the Airport Sheraton Hotel.” (App. at 23.) He further alleged that he returned with his luggage directly to the airport the next day and that a TSA agent, after x-raying the luggage, opened it with a key that Revell gave him. Taking those facts as true, it is clear that the gun and ammunition were readily accessible to Revell during his stay in New Jersey and, thus, by the allegations of his own complaint, he was not within the scope of § 926A. Dismissal of the § 926A claim was therefore proper. The end result of this is that if you’re flying with guns, make sure your connecting city is a city where your guns are legal to possess. I’ve generally been careful about this when I fly with guns. So far this only applies to the Third Circuit, which is Pennsylvania, New Jersey and Delaware, but other circuits are likely to notice this ruling and use it. Sorry folks, but it would seem FOPA only applies to vehicles on the highway. VPC seems to want to imply that Thirdpower, a veteran who has served and continues to serve his country, is barely literate. They suggest he needs to do “more readin’ and less shootin’ bub.” Regardless of the merits of their argument, I find this to be mean spirited and rude, and telling of the stereotypes and prejudices the folks at the VPC apparently have about gun owners. I might have even been willing to concede VPC’s point on the quote, since they only directly quoted “I’m done,” but their paraphrase of the rest could conceivably change the definition of the quote, depending on whether there’s a dropped comma between “away” and “from.” In the context presented, the quote doesn’t make much sense. Thirdpower’s accusation that the meaning was altered is entirely plausible.